It's too bad that Charles Fort is no longer alive. I think he would even be amazed by what I've found. Fort (1874-1932) was born in Albany, NY. He was a writer/researcher who used to collect all sorts of odd items from various newspapers, stories about strange lights in the sky or fantastic coincidences. My discovery today is definitely Fortean. Unbelievable. Two different visits, two different locations, but same event occurred! Each time a man came in with a cigar box and was paid $712.37 for the contents within said cigar box. But that's not all. If you keep reading each ad, you'll learn that back in March a man visited THR at the Super 8 motel and was paid $5700 for a Fender guitar that his father owned. But during THR's recent visit at the Hampton Inn & Suites the same thing happened again! I hope this doesn't mean that THR is using canned copy, inserting new details as needed when they run this ad. You know, a boilerplate where the name of the city and the motel is changed. That would imply shenanigans. But don't worry. Those brave investigative reporters at the Press-Republican will make sure no scams are going on. After all, the PR is the Hometown Newspaper of Clinton, Franklin, and Essex Counties. It protects its readers. If you can't believe in a newspaper, then why bother with it? Why should you trust a paper that rails against deceit, that advocates openness and truth, when it runs dubious advertising? 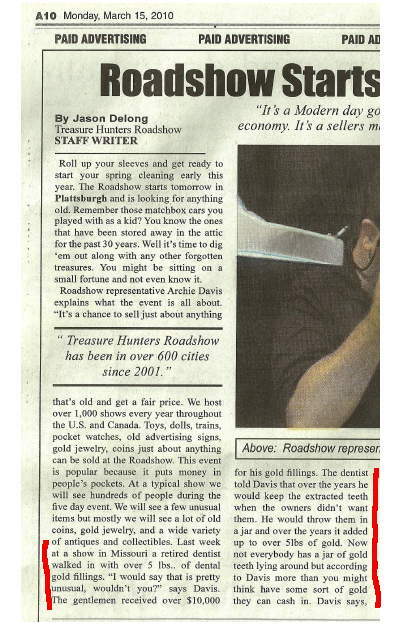 Once again the Press-Republican is letting Treasure Hunters Roadshow -- not to be confused with the PBS program, Antiques Roadshow -- run full page ads that need some scrutiny. The ads are really advertorials, i.e., at first glance they have the appearance of a news stories written by a "STAFF WRITER." But that writer is employed by THR, not the PR, if you read closely. THR got into a bit of trouble for its ads looking too much like news articles. The Better Business Bureau requested THR to include a notification with each advertorial that it was really an advertisement. Somebody slipped up at the PR on Monday, June 28 (page A12). Here's a JPG scan of the upper part of that ad. Notice that there's no Paid Advertisement notice across the top of the page. Now that a look at the next day's ad, June 29 (page A10), the top part. Paid Advertisement is repeated across the top, giving the reader the needed info that while the story is formatted like a news feature, it ain't one. But there are other problems besides the appearance of the ad. Google "Treasure Hunters Roadshow" and you'll find some articles questioning the practices of this company. Doesn't anyone at the PR know how to use Google or any other search engine? Or does it avoid digging into the background of an advertiser when it takes out a full page ad in color that means a good chunk of $? And it's not just the ads. Check out page A6, June 28, the Home and Garden page. 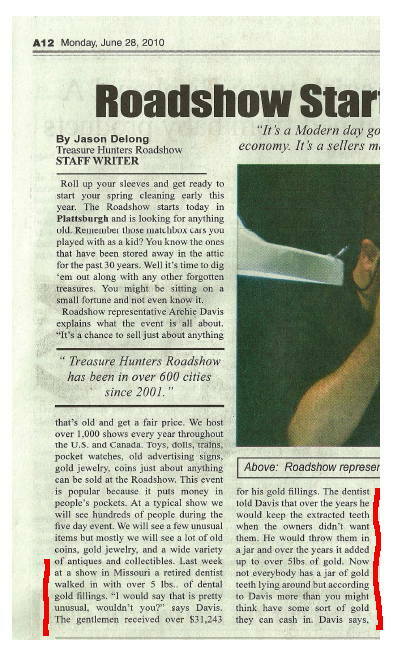 Under HOME BRIEFS is what appears to be a news article, "Roadshow comes back to town,' complete with the dateline PLATTSBURGH. Some people don't realize that a newspaper will run press releases as if they're really news, not canned copy. Forget about so-called "journalistic objectivity" when you read that crap. In an editorial dated June 13, 2010, the statement is made that you can trust the Press-Republican for national and international news because it uses the Associated Press, a trusted source. But can you trust the PR for local news when advertising money blinds its eyes? "Local newspapers are desperate for advertising dollars. But in a rush to whore themselves for decreasing amounts, they are abandoning their mission and jeopardizing the very populace they enjoy claiming they benefit and serve, all the while whining about being ripped off by those dastardly bloggers who have no sense of responsibility… or ethics." Those evil bloggers, rant the mainstream media. You can't trust them. Trust us. Please note this blog doesn't accept any advertising. 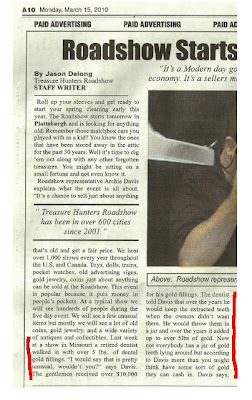 The Treasure Hunters Roadshow. Taking out full page ads in the Press-Republican. Looking to buy old coins, toys, comic books, and gold. When it comes to that last item, THR ain't particular where it comes from. "Last week at a show in Missouri a retired dentist walked in with over 5 lbs. of dental gold fillings... The gentleman received over $31,243 for his gold fillings." "Last week at a show in Missouri a retired dentist walked in with over 5 lbs. of dental gold fillings... The gentleman received over $10,000 for his gold fillings." Amazing. How two different dentists months apart in the same state -- Missouri -- would end up bringing in gold from extracted teeth and get top dollar -- well, the second dentist did, $21,242 more for five pounds. The price of gold must've really jumped. Like they say, Missouri is the "Show Me" state. THR did run into a bit of trouble in one state because the scales it used to weigh gold weren't officially inspected. I wonder if New York State has regulations regarding scales and if it does whether the scales have been certified during THR's visits. Of course, those investigative reporters at the Press-Republican have made sure no shenanigans are going on. That's why you can trust every ad in that newspaper, especially the full page ones. So what do you do with a closed schoolhouse that was built in 1915? Simple. Turn it into a museum. The Adirondack Historical Center Museum is housed in the Elizabethtown, NY Union Free School building. Presently on display is "A Sign of the Times," an exhibit featuring old signs from around the region. But if you have the time, walk around the outside of the museum. You'll see carved signs over the side entrances that reveal a key aspect of societal norms back in the milieu when the schoolhouse was built. Plattsburgh Public Library Sauna. 6/28/10. 4:55 PM. Until the AC is fixed, don't forget to bring your own towel. Hyperlocal: Focusing on people and events in your locality. Combine the two and you end up with the Name Pending Show, created and produced by Caleb Mosher. In a roughly half-hour format Caleb covers the Plattsburgh area, spotlighting rock bands and comedians, crafty visual artists, even a giant snowman who likes waving at passing cars. 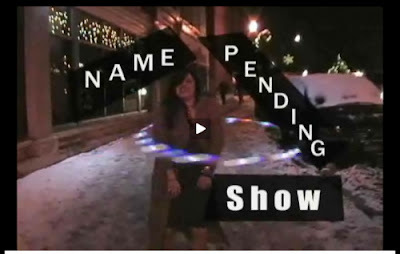 And sometimes serendipity plays a part: one snowy night there's a young woman twirling an illuminated hula hoop who's agreeable to be videotaped. The result is visually interesting, as they used to say on the original American Gladiators series. As any DIYer will tell you, all the effort isn't driven by the profit motive. Usually there is no money to be made. Caleb does his show as a hobby, for the love of it. "I don’t watch much TV," he explains via email. "The shows I like are pretty much always canceled. So I am making my own TV show for mostly my own entertainment. My show might not be that good but it’s much more fulfilling than simply spending those hours watching TV and complaining that nobody knows how to make a decent show anymore." It might look easy but for a half-hour program there's a lot of time involved in getting the show ready. "I would guess that I shoot about 6 hours of footage for every half hour of footage that goes onto the show," Caleb says. "Much of the raw video I can’t use and other stuff just isn’t good enough." But the raw footage is just the beginning; all that video has to be edited. Caleb's rough estimate is around "12 hours an episode or more" to render the final product into a DVD version. He uses old but viable equipment: mainly MiniDV camcorders (they record with that primitive medium called tape) and a six year old PC for editing. "MiniDV is pretty much an obsolete format now," says Caleb, "and you can’t really buy the camcorders in normal stores anymore. Everything I use is stuff I have found on clearance or in thrift stores." "There is no budget for the show," he adds. "None at all. There is pretty much only the effort that I put into it. And that’s the beauty of working in a digital format. It’s amazingly cheap but you can still do a lot with it with some effort." Even his post-production set-up is inexpensive but adequate. "When I am editing I sit on a computer chair I got at a garage sale for $5. It still has the $5 tag on it. My computer desk is one that I found on the side of the road in Watertown NY. It has been broken apart 3 times and put back together. This last time I had to buy sections of 2X4 to nail it back together again. It’s amazing the thing hasn’t fallen apart yet. I can’t say enough good things about particle board desks that are made in Canada. They last." Don't expect a major TV network executive to describe his office in such an economical manner. Despite all the money poured into a mainstream show, it can be unwatchable while a DIY effort just a few clicks away holds your interest. Is it just me or is there something Freudian about this display? Once again the air conditioning is busted at the Plattsburgh Public Library. 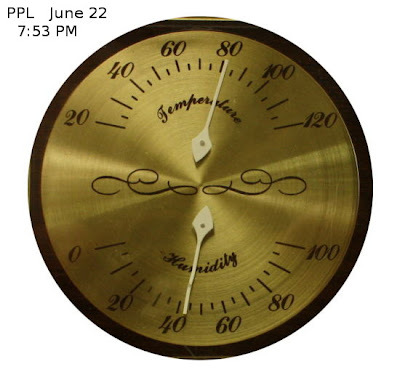 Not a problem if you enjoy temps around 80 - 86 degrees F or higher. The needed part to fix the AC is on order and might be here this week. It's not the first time the system has gone south during hot weather. I hope that the city isn't pinching pennies with the AC like it did with the main entrance at the library. For years the front steps keep crumbling and the city would just patch them up. The stubborn steps would crumble again. After wasting time and money the city finally wised up and spent the funds to make a more permanent fix. Is the library central heating-cooling system due for an overall or even a whole new system? If the city can build a parking lot that sits empty by the lake, it can afford to pay for a new system if it's required. Meanwhile, rumors are circulating that City Hall is considering the issuing of a dispensation for both employees and patrons at the library. The dress code will be relaxed. Under the dispensation one may wear a T-shirt and shorts -- or no shirt at all -- when the temps are in the 80's. Also allowed will be briefs, bras, bikinis, thongs, summer nighties and even pasties (depending upon gender, of course). When the heat rises above 90, nudism will be optional. Hey, you gotta stay comfortable. If I was running for office, a thumbs-up from a naked Barbie doll would be vital for victory. When I took this photo the other day, the police officer was running both his emergency lights and siren. But sometimes the siren remains off. Why? What was that red streak? A fireball? No, it was a city police car speeding by. I'm looking out the front window of a downtown coffeehouse one evening when I see the bright blur. No warning, at least no audible warning. The car zipped by without a siren, shooting down Main Street. This has happened to me a couple of times. I'm sitting at a table and then there's a startling flash of red ripping by. Why isn't a siren on? I asked that question again last night. I'm walking home, around 9 PM, dusk, approaching an intersection. From the opposite direction a police car pulls out from a parking lot, lights flashing. It makes it way around three cars waiting at the stoplight before turning and speeding away. No siren, not enough one short horn "blip." So I've done some digging via Google. In New York State police officers are required to run their lights to warn motorists on the road when responding to an emergency call. But according to New York State Vehicle and Traffic Law, Article 23, Section 1104, "an authorized emergency vehicle operated as a police vehicle or bicycle" doesn't have to run a siren. I don't know why a police car is allowed to run silent while an ambulance has to use an audible warning system with its emergency lights. Maybe the police are trying to sneak up on the bad guys? The same section also states: "The driver of an authorized emergency vehicle may... Exceed the maximum speed limits so long as he does not endanger life or property..."
As reported in the Albany Times Union, in August 2009 a police cruiser in Albany was responding to an emergency call when it broadsided another car, a 1992 Honda Civic, operated by a civilian driver. The passenger in the second car was killed. One of the key questions in the case was whether or not the police officer was operating his siren. Some witnesses and a recording of radio transmissions during the incident backed up the claim that the siren was operating before the crash. If an accident does occur with a police vehicle, it helps the officer's case if he had flashing lights and siren operating at the same time. As the Times Union stated, the siren being on or off before the crash "could loom large in the lawsuit" being considered by the family of the dead passenger. So why are a few officers of the City of Plattsburgh PD taking chances during with silent runnings? I'm glad I'm not a visually impaired pedestrian. Subjects for macrophotography can pop up anywhere. Even in your sink. I found a beetle either stunned or half-drowned after I dumped out some water in my kitchen sink. Since he was so cooperative, I posed him on a white sheet of paper under the fluorescent ceiling lights in my kitchen. Now that I have a DSLR I can use my macro lens and get some "monstrous" shots. I'm not too happy with the lighting in the image but I was doing this on the spur of the moment. I didn't know if he was going to revive and scurry off before I could get my shot. It takes time to set up a tripod and adjust the lens for the magnification you want. Even with the color balance on the camera set for fluorescent lights, I still had to adjust the color in my photo-editing program; everything came out with a pinkish tint, especially the white paper. Next time I'll custom balance before shooting if my subject is just hanging around, willing to wait for me. After he was done posing, I put him outside. Maybe an entomologist in the audience can tell me if I let a menace back into the wild. Or whether I should have been wearing protective gloves. Notice something unusual in this image? Get the feeling that something is watching you? I switched to a longer lens and different position to make the odd formation obvious. It's after midnight. My windows are open, one fan blowing out hot air, another one drawing in cool air. A whiff of smoke irritates my sinuses. But thanks to my chronic allergies, my nose plugs up and the odor quickly drops from my olfactory radar. Then I hear sirens. I look outside, see flashing lights. I grab my camera and investigate, walking down the street. Drifting smoke, haze under the streetlights. Fire trucks and police cars. Fortunately I don't see anyone taken away by an ambulance. I don't see flames shooting out of the building as I have with other nighttime blazes. It seems that the fire was caught just in time. Even though it could be worse, the smoke and water damage must be bad. I always worry about a fire in my building. There are things that no amount of insurance can replace. Next time I smell smoke I'll double-check. It could be a lot closer than I think.